I mean… with Maestro®, the new closure concept for sparkling wines and Champagne. You love to drink Champagne but loathe the laborious opening process? You love the popping noise but fear for your windows or ceiling? Maestro® by Alcan Packaging is the answer to your worries. The Maestro® closure is an opening system mounted on crown closures for shipment. It can be adapted to standard champagne bottles or special bottles on request for 37.5 cl, 75 cl and 150 cl bottles. The opening lever can be customized to match every shade. The dome is built into the overcap closure with all the standard finishing process. What does it mean for the consumer? A great change: you lift the lever with two fingers (believe me, I tried it) and pop! your bottle is open with this delightful noise, prelude to a nice moment. That’s the beauty of the system! One has all the pleasures linked to opening a bottle of champagne with none of the hassles: no tainted cork since there is a capsule under the overcap, the design, the popping noise, the foam of the wine poured in the glass. What? No cork! How awful! I can already hear the traditionalists crying over their cork. The champagne will taste differently, it won’t be able to age as much and as well, blah blah blah… First of all, may I remind the purists that champagne spends more time with a capsule on than with a cork in its life? Second of all, one of the most famous “Femme de Champagne” gave its credibility to the Maestro® system: famous for linking heritage and modernity, Carol Duval-Leroy, has chosen to be the first to use the Maestro® concept as the closure for its very beautiful cuvee Clos des Bouveries Vintage 2004 adorned with new packaging! 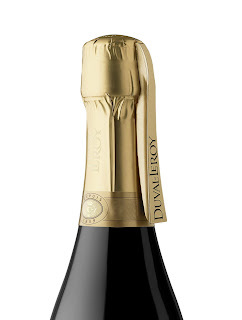 “The closure issue is of crucial importance for the Champagne region, and to open the debate by proposing this Maestro system ® on a cuvee coming from the House’s oldest vineyard parcel, indeed sums up the links between heritage and innovation conveyed by the family of Duval-Leroy since 1859”, explains Carol Duval-Leroy. Convinced? Not quite? Go get a bottle of the great 2004 Clos des Bouveries by Carol Duval-Leroy: you’ll become a new fan of the opening system and the champagne. I can’t wait to see more bottles of Champagne with the Maestro® system! Luxury packaging: a "must" to sell wine? Millesima.com, on the way up to Web 2.0? Of course! Except that since I can hardly pop a regular cork without hurting one of my guests or cracking my ceiling, I wouldn't try to saber a bottle. 🙂 Shuddering only at the thought. That's why I was so happy to discover this closure. Long life to technology! Fascinating. Is the Duval Leroy available in the U.S.? I think the wine is available in the US but you'll have to contact Duval-Leroy to know if it's available near you. this is a nice novelty, but I hope it doesn't catch on. I prefer the traditional closure. The nice part of this closure is that it feels exactly like the traditional closure: the wine is not altered, you hear the "pop" sound and the flow of the wine in the glass is identical. The experience is as enjoyable as with a traditional cork.